The trial of 6 Greeks and 7 Greek Cypriots, who are accused of smuggling arms to Cyprus and inciting riot, has been continued yesterday in Paphos after being adjorned on March 19th. The prosecutor stated that the arms-smuggling is related to the riot campaign of Greek Cypriots against the government. It is also declared that PEK, Union of Cyprus Farmers, has been cooperating with the Communists in the riot campaign, with the approval of Makarios. 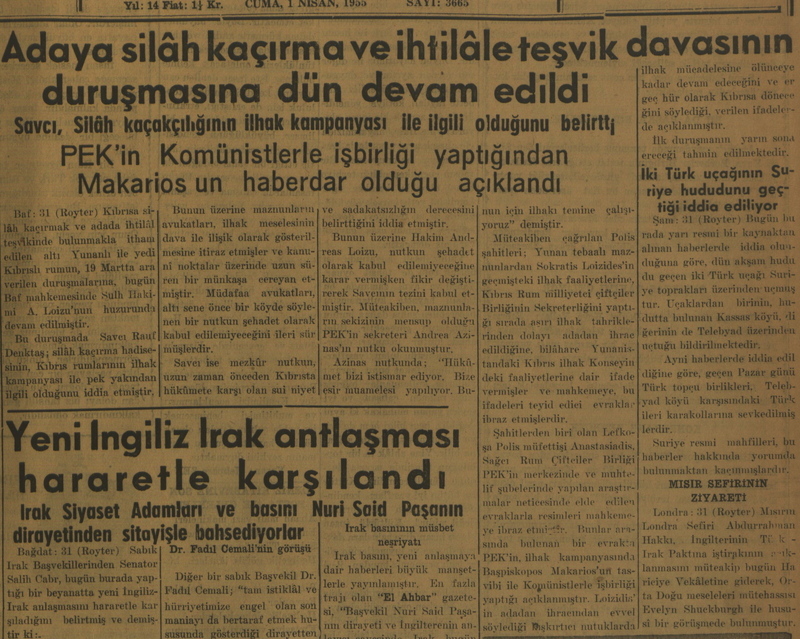 "Adaya silah kaçırma ve ihtilale teşvik davasının duruşmasına dün devam edildi," in Halkın Sesi, April 4, 1955, p.1. R.H., “Proceedings of Agios Georgios/St George ship confiscation trial, 1955,” Cyprus Critical History Archive: Reconsidering the culture of violence in Cyprus, 1955-64, accessed April 25, 2019, http://ccha-ahdr.info/items/show/4.